There’s a lot to love about autumn, even whilst we mourn the departure of another all-too-brief summer and groan at the all-too-early arrival of Christmas in the shops. I always feel it’s a rather squeezed season, lacking its own traditional focal point (Hallowe’en doesn’t really count), but I also think it’s a grown-up time of year. It certainly puts on a fabulously sophisticated colour show! Those colours have to be my favourite aspect of autumn. Scarlet, mustard, ochre, gold, pumpkin. Partly inspired by my love of these shades, I came up with the concept of doing an autumnal lookbook. The idea is to inspire you to reconsider the patterns as you pull together your autumn/winter wardrobes – perhaps you have a Carnaby Dress that will now work layered with opaque tights and a turtleneck, or a couple of hours to run up a quick pair of Portobello Trousers in a winter-beating wool. You can see the full lookbook here but I’ve detailed below the fabrics used for each look. 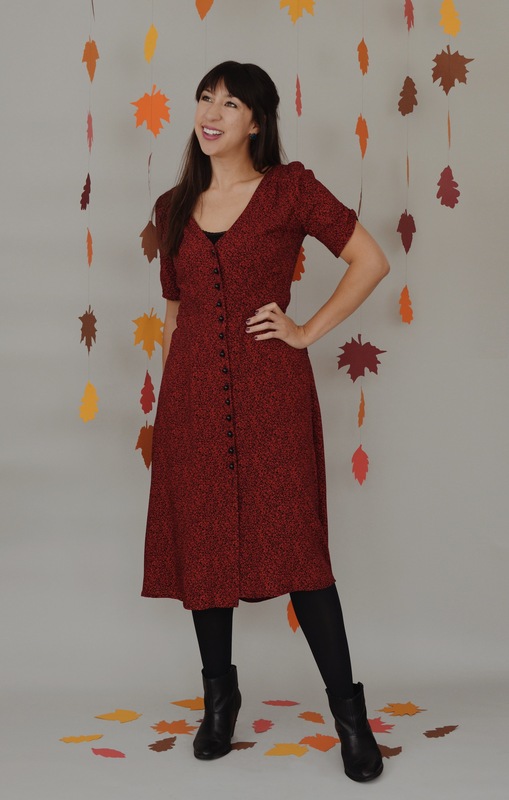 This Carnaby Dress was made in fabric from Sew Over It; I think they’ve sold out of this particular one but they still have a good selection of richly coloured wools. These Portobello Trousers, shortened to culotte length, use this wool blend from Dragonfly Fabrics. It’s significantly more vibrant than the shop photos suggest and perhaps even more than you can tell from these photos – I love it! This wintry Kew dress is made in a Sew Over It rayon, Mini Meadow. The buttons came from the Craft and Sewing Superstore in Tooting. I’m so thrilled with the seventies’ vibe of this faux suede Kew skirt. The camel-coloured faux suede is from Fabric Godmother and the quality is really excellent. And I made a Bloomsbury dress! This, my absolute favourite hack right now, is made in lightweight denim from Fabrics Galore. I’m planning (always planning) a blog post on how to hack the Bloomsbury Blouse into a dress, but really it’s incredibly simple: I extended the blouse down the centre front and back to the length I wanted, then did the same with the side seams maintaining their angles. The hem is just slightly curved up at the sides. You could use an existing shift pattern to help with this. I hope you like the Autumn Lookbook and it provides you with a little inspiration for some seasonal makes. Personally I’m just loving blending in with the trees right now! These outfits are all so gorgeous! I love autumn colours. Your portabello culottes especially have a stunning shade of mustard.